The NFL has fined Oakland Raiders running back Marshawn Lynch for a hand gesture made during last Sunday’s game against the Tennessee Titans, according to media reports. The fine is for $12,000. The gesture made by Lynch was a double bird and was flashed by the Raiders running back in view of a CBS camera. The network was televising the NFL game during Week 1 of the regular season. The incident took place as Lynch was coming off the field following a run during the fourth quarter. Even though the gesture was not looked upon favorably by the NFL front office, Lynch had a strong debut in his Raiders uniform playing for is hometown team. The Oakland running back rushed 18 times for 76 yards and helped the team run down the clock during the fourth quarter to preserve the lead. The Raiders won 26-16. Khalil Mack might not have been credited with many tackles, but the Raiders defensive end had a huge impact on the game’s outcome. 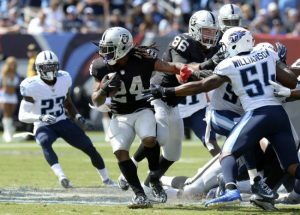 Mack was credited with just three tackles, but his play improved as the game wore on and Tennessee had to send two to three players to block him giving other Oakland players an opportunity to make plays. The New York Jets visit Oakland Sunday and may try to block Mack with more than three players. Todd Bowles the Jets head coach said he might have to try blocking Mack with five to six players. Bowles called the Raiders defensive standout a tough player, an All-Pro and for good reason. He wants his offensive blockers to just slow Mack down so the team can make a few big plays. The Raiders have closed in on signing an extension of two years with Donald Penn their left tackle. A report surfaced on Thursday that said Penn, who was a holdout during training camp due to seeking a salary that is amongst the top 10 left tackles in the league, and the Raiders would sign a new deal. His current salary for 2017 is $5.95 billion which ranks him as the No. 23 highest paid left tackle in the league. Gareon Conley the rookie cornerback for the Raiders who was their first round pick out of Ohio State fully participated in practices on Thursday for just the first time. The rookie cornerback did not play any of the team’s four games during preseason and missed Sunday’s opener due to an injured shin. However, he could debut on Sunday against the Jets.